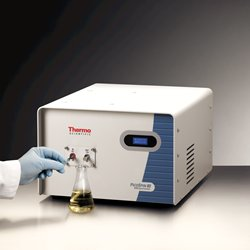 Dr. Andy McLachlan, European Senior NMR Applications Specialist at ThermoFisher, gave a free webinar about different industrial applications using Thermo’s picoSpin 82 MHz benchtop NMR spectrometer. Andy got his PhD in Chemistry “NMR technique development” with Prof Gareth Morris at the University of Manchester, UK, sponsored by AstraZeneca. Then he became the Applications specialist at ACD/Labs in Canada and the UK from 2010-2012. 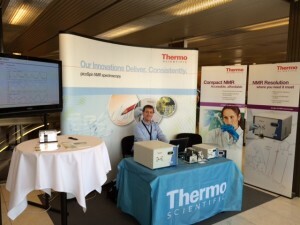 His current role at ThermoFisher involves visiting chemical companies and universities to demonstrate equipment, run application feasibility tests, and support industrial collaborations. Forensics – Designer drug analysis and using Mnova’s NMR prediction tools to help assign a structure. Food authenticity – comparing benchtop NMR to established non-NMR analytical methods. Quick answers and problem solving with benchtop NMR – when FTIR and rheometry just will not do.